The trip yesterday was hard work and arriving at the Fushia B&B we we’re wet and although we had enjoyed the day, it had taken more out of us than perhaps we knew. But waking to yet another good English Breakfast, this week we have not had a bad breakfast, yes one was OK, but generally they were all very good. The forecast for today was sunny intervals between an overcast sky. This ended up being slightly backward, as it was mostly sunny with a few cloudily spells, this made for a truly spectacular walk. We headed from the B&B down toward Clovelly, we didn’t quite go through Clovelly we skimmed the top and followed the path off towards Clovelly Court, the path was slightly undulating but not too taxing to start off with. We headed towards the Angels Wings Shelter and then off to Wilderness Summerhouse. This stretch is high above the cliffs with great views looking back toward all the places we’d been to on this walk so far. From here there was a description on how to carry on not on the official SWCP but a ‘do’able path down to Mouth Mill. Well this route was not exactly easy and intact quite difficult, I would say even dangerous if wet. We certainly would not recommend using this path unless it gets a lot of work done. 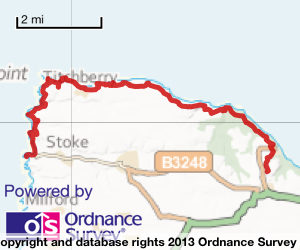 From this point the route takes you back to the undulating ups and downs of the typical rocky coastal path. Heading on to Windbury (Iron Age Settlement) and then Eldern Point the whole stretch continually showed us beautiful vista’s which I tried, but probably failed, to capture some of which you’ll find towards the bottom of the photo’s SWCP 2013 page. Looking down from Eldern Point into Shipload Bay Anne again spotted seals in the sea, but this time there were at least 9 bobbing up and down in the water, unfortunately around this point I lost some favourite sunglasses of mine, oh well. Heading onto Hartland Point where we took some refreshments, the second rest of the day so far and Hartland Lighthouse I took a 360 Pano which I’ll link to later, although the Lighthouse does not appear in the pano. From this point onwards the views became more spectacular and the undulations more taxing. This stretch is awe inspiring and although a long’ish and tough day if you get the change on a clear day then I’d highly recommend you find the time to give it a go. If it is clear you’ll also get a completely different perspective of Lundy Island as the walk progress’s. So we finished where we started back at The Hartland Hotel, this time we were given room 7 and our heads dropped, until we opened the door and found the only other bay window, this time at the other end looking out toward Lundy and Hartland Quay FANTASTIC. 11.1 miles Distance, including extra walks to beaches and to the ends of any points we visited.